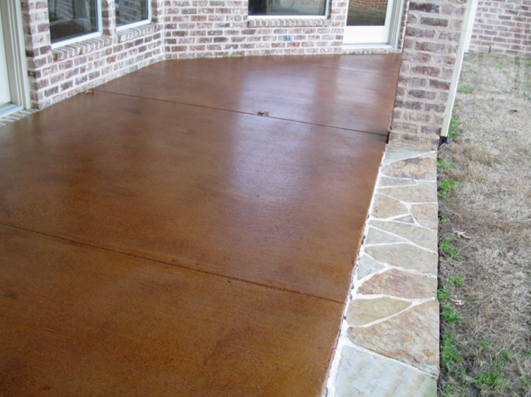 Concrete staining is a great way to inexpensively turn your home or business interior and outdoor living areas into a work of art that will impress all of your friends and guests. Stained floors provide an elegant look that will transform your home's interior flooring, concrete patio, driveway, walkway, or pool deck into an oasis. You will wish you had made this transformation years ago. Decorative concrete flooring is a great way to provide your home with a low-maintenance, highly durable beautiful floor that will last the lifetime of your home. If you are looking to go-green, then choosing to go with a decorative concrete for your home flooring is a great option. By choosing this option, your concrete slab foundation has a dual purpose of being the slab, as well as the finished flooring in your home. This eliminates the need for carpeting, tile, or hardwood flooring that would eventually require replacement. Are you dealing with a huge screw up or mess from a previous vendor? You will love working with us. We've been doing this for dozens of years and we know what works and what does not work. While we hate that customers have run into these issues, we are professionals at cleaning up other peoples messes. Call and let us know what you are dealing with. What are the dimensions of your project? What is the urgency of your project? Be prepared to tell us what you see so we can help understand as much as possible before making an on site visit. We have been working with concrete solutions for many years, even before it was cool. Having years of experience and knowledge of the process has enabled us to perfect our technique and provide you with the best looking floors in the entire Dallas Metroplex. Our professionalism is top-notch and we are the ones that other contractors look to for advice. We only use the highest quality materials which will keep your floors looking beautiful for a lifetime. We are have been voted the best full-service decorative concrete company in all of Dallas / Fort Worth. Our expertise, and knowledge is not only how to install coloring and sealant properly, but also how to prepare the surfaces prior to installation. As with any type of construction related job, the preparation work is the most important step of the entire process. 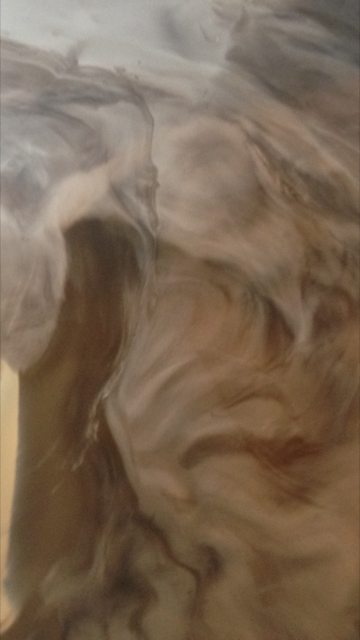 Without proper preparation of the surfaces prior to the installation, the surface installation will fail. Not surprisingly, we are contacted by prospective clients all the time to repair the failed work completed by other companies in the area. We typically determine that the most of the time the reason for the failed work is lack of preparation of the surfaces prior to installation of the stain or overlay. We pride ourselves in taking the proper amount of time for surface preparation to ensure you will have a long-lasting floor. Metallic epoxy floors look spectacular and unique. You can literally transform your home, or business into a masterpiece simply by choosing this option. Every floor will look unique once we apply the metallic epoxy coating. Your friends will be amazed, and any visitors to your business will definitely remember you based on how unique and customized your floors look. We take great pride in all of our work, but we must say that working with metallic epoxy flooring is one of our favorite. The color combinations are unlimited, and our team of experts will guide you through making a color selection that fits your personality and the dynamic of your home or business. 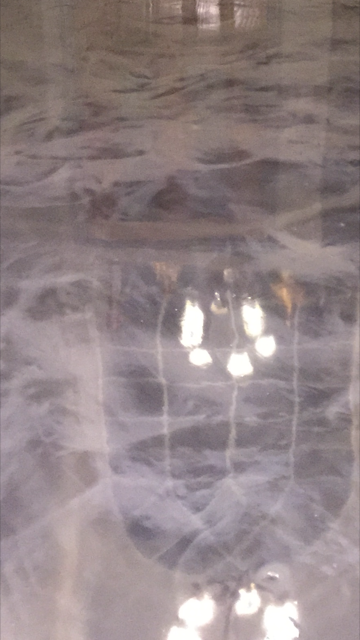 Metallic epoxy flooring is great for any type of business like Bars, Restaurants, Showroom Floors, Hospitals, Offices, Hotel Lobbies, Churches and much more. If you are considering epoxy flooring in your home, these coatings look great in every room, Kitchen, Dining Room, Family Room, Bedrooms, Bathrooms, Media Rooms and Man Caves. No matter if you are simply looking to make your floor space pop with color, or take on more of an elegant type of appeal we can definitely produce the outcome you desire. 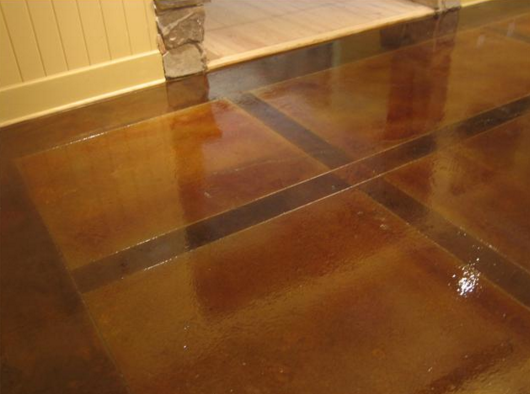 A stained and polished concrete surface is a very low maintenance, versatile solution for your interior flooring. KItchens, dining rooms, bedrooms, bathrooms, and hallways, all look amazingly elegant with floors that have been stained. With proper installation and design, a stained floor provides elegant beauty that you will not find in other types of flooring. Due to concrete being so receptive to multiple coloring methods, it is possible for a highly trained professional to produce near exact replicas of most expensive building materials. Granite, marble, travertine, can all be replicated with the right tools, coloring and knowledge. Add in the aspect of the ability to cut, pattern, stencil and polish concrete and the possibilities become limitless. 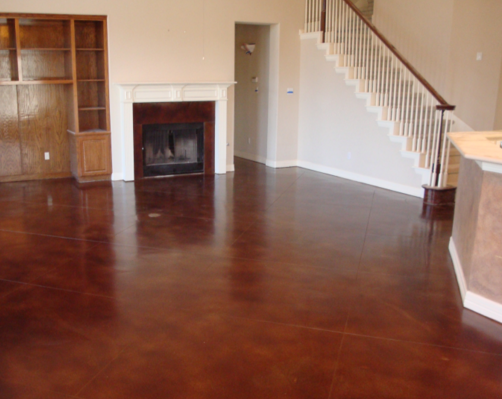 The cost of staining, and polishing a concrete surface is similar to the cost of installing a tile floor, but as with anything the price depends on materials used, designs, and surface area. We would love to be able to provide you with a FREE quote for your project. 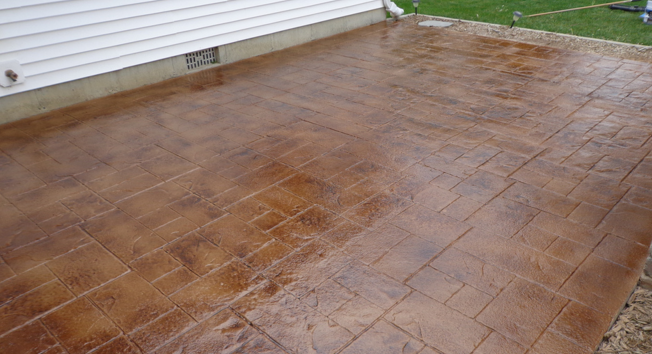 If you are looking to replace old concrete surfaces you may be interested in a stamped concrete solution. 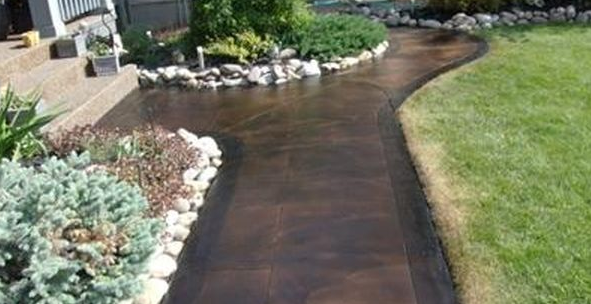 It is very durable and can be installed on both new and old concrete surfaces. Going with a stamped concrete overlay is a great way to freshen up your old, boring, damaged concrete flooring. 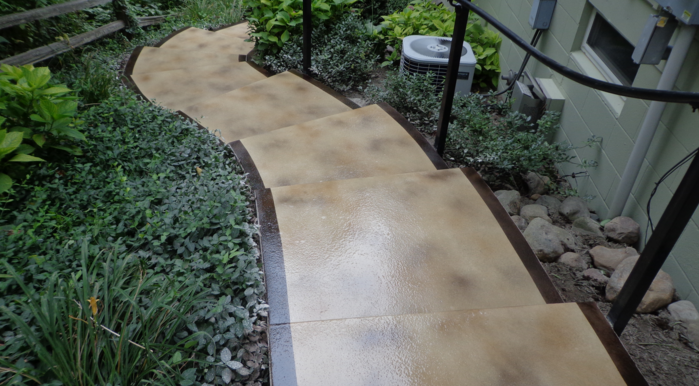 You can choose from many different designs and texture options when choosing to go with stamped decorative concrete. Stamped concrete can be made to resemble different types of stones or textures, and is functions great if installed on driveways, garage floors, pool decks, patios and interior flooring. 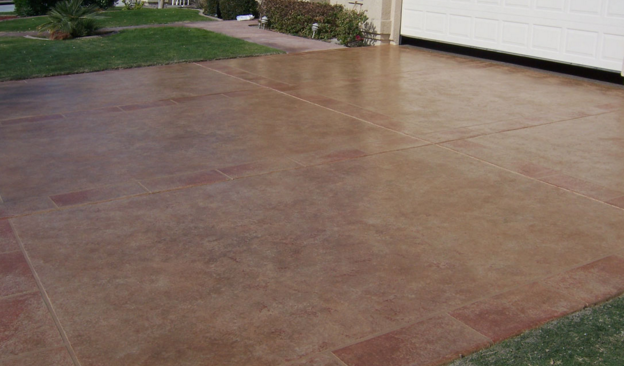 Stamped concrete is mostly considered to be an outdoor surface but can be used indoors as well. It is very durable and versatile and will not peel or flake. It is the closest thing to real stone that you can find on the market today, however, it is so much more cost effective. 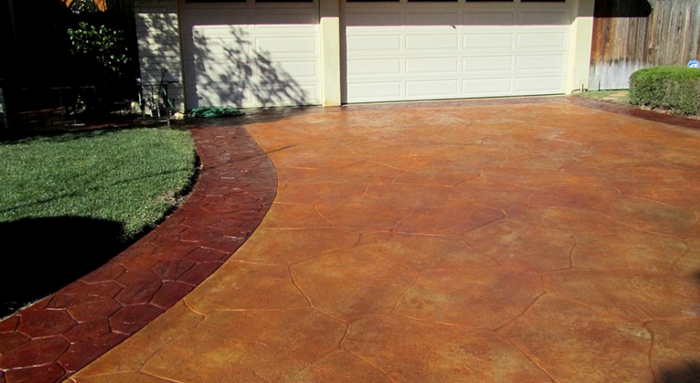 As with staining, stamped concrete can simulate so many different types of materials. As with any other structure, proper maintenance of your stained and stamped floors will increase the longevity of your investment and keep your floors from fading over time. Having your floors sealed is a must, and you must also use the highest quality floor sealer to ensure color stability as well as resistance to normal wear and tear. We have the knowledge and the tools to seal your floors properly. CALL US TODAY FOR ALL OF YOUR CONCRETE FLOORING NEEDS!